Fig. 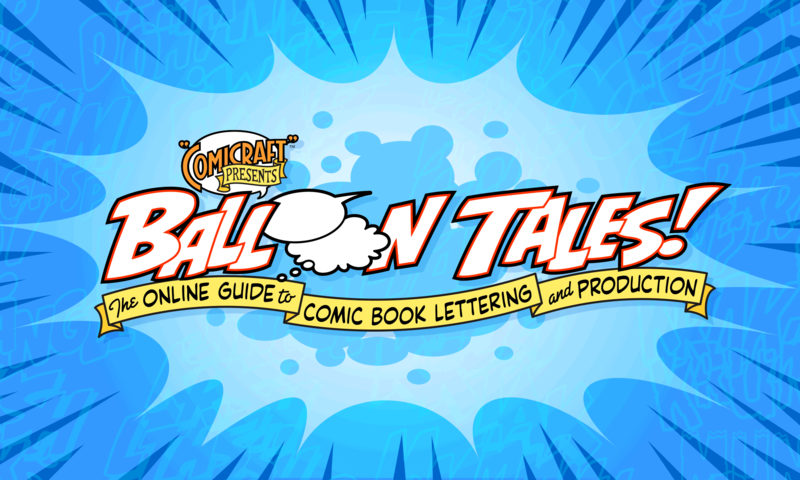 1: Letterer John Workman likes to put a lot of air in his balloons. BALLOON – circular shape used to contain speech — and “Air” — in a comic book. Sometimes referred to as “Bubble,” but not by us, we’re professionals. BORDER – the outline of each panel or frame. BURST – a jagged balloon shape used to indicate yelling or screaming. BUTTING – connecting or masking a balloon to the edge of a panel border. Fig. 2: This narrative Caption features a Drop Cap and a scrolly bit. COUNTER – the enclosed space in letters such as A R B P e d q and so on. Fig. 3: This “Deflated” or “Weak” balloon also utilizes some Fireflies. CROSSBAR “I” – is used for the pronoun “I”, as in “I’m”, “I’ll”, etc., and for the pronoun “I” only. The appeaance of a crossbar “I” in the middle of a word is an obvious sign of an amateur lettering job. DEAD SPACE – the area in a panel that begs to be filled with captions and balloons. DISPLAY LETTERING – Sometimes known as “Title Lettering,” display lettering includes story title lettering but also covers SFX, Signage, Credits and any and all Calligraphy or Labels on cans or boxes or items in the artwork. Fig. 4: An Elbow tail, along with a couple of SFX. DOUBLE GUTTER BURST – Actually a single gutter balloon, this balloon is not really a burst but two balloons — one inside the other. This style is favored by some writers and letterers to indicate yelling, but not screaming. DROP SHADOW – A second rectangle-shaped box behind a caption — often colored — to specifically indicate first person narration. ELECTRONIC LETTERING COMPOSITION (E.L.C.) – the process of combining digital lettering with finished color artwork to produce files for printing. Fig. 5: A typical Electric balloon, complete with Lightning Tail. FACE – typestyle, letterform or font. FOOTNOTE CAPTION – the small caption at the bottom of a panel in which editor’s notes explain asterisked (*) items in the balloons or captions above. GUTTER – The space between panels. Fig. 6: Two “Loaf of Bread” shaped balloons, connected by a Join. HYPHENATION – is to be a-voided when-ever poss-ible! ICY BALLOON – A balloon that appears to have icicles hanging off it, used to imply that the speaker is pissed off! Fig. 7: A page with Captions, Loose Lettering, a Title and Credits. MANGA BURST – an erratically drawn burst balloon used not only to suggest yelling and screaming but also to indicate that the speaker’s eyes are popping out and his blood pressure is going off the scale. Fig. 8: A Mask keeps this balloon from covering figures and other important, er, objects. ‘NUFF SAID – Silent page. PANEL – a frame of action on a comic book page. Also called “Frame,” natch’. Fig. 9: A typical balloon placement guide as provided by the writer. ROBOT BALLOON – a rectangle shape with sliced off corners and lightning tails most often used to indicate that the speaker is a robot. RULE #1 – See Storytelling. SAUSAGE – a balloon that is short and wide, resembling a sausage. Generally a sign of lazy Word Arrangement, though master letterers Tom Frame and Todd Klein somehow manage to use them successfully. Fig. 10: The bottom of this SFX has been weathered with Roach Chew. SCREAMER – An Exclamation Mark! Note that SFX are NOT exclamations and should not have exclamation marks, and that exclamations themselves only need one exclamation mark. SKOOTCH – to move lettering elements such as balloons or SFX slightly. SPECIAL BALLOON – a unique balloon shape, often used in conjunction with a unique font to indicate a particular voice, perhaps when a character is possessed or demonic or from another country, planet or dimension — or all the above! Fig. 11: Open, or Hollow, SFX allow the artwork to show through the letters. STROKE – the thickness of the outline of a balloon or SFX. TANGENT – when the edge of a balloon or another piece of lettering coincides with a line of the artwork (or the panel border) it can Objectify the lettering in the reader’s mind. Something to watch for and avoid — usually a quick skootch will fix it. Fig. 12: Masking the Thought Balloon underneath his foot breaks the 3-D Plane, causing the lettering to become Objectified. oon suffered from Gridlock, and bad Word Arrangement left too many Parking Spaces. After: just the right amount of Air, and a Widow at the end makes for a pleasing TV Shaped word balloon. WHISPER – traditionally a dashed or broken balloon outline is used to indicate that the speaker is whispering. With the advent of computers, gray text and balloon edges are another option made popular by those awfully nice chaps at Comicraft! ZIG-ZAG TAIL – a balloon tail with extremely sharp Elbows. Can be used to indicate loud speech and/or an electronic voice.